Thomas Allsen is one of the foremost historians of the Mongol empire. His latest book breaks new scholarly boundaries in its exploration of cultural and scientific exchanges between Iran and China. 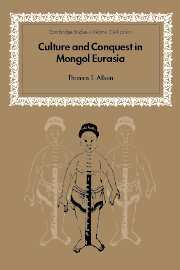 Contrary to popular belief, Mongol rulers were intensely interested in the culture of their sedentary subjects. Under their auspices, various commodities, ideologies and technologies were disseminated across Eurasia. The result was a lively exchange of scientists, scholars and ritual specialists between East and West. The book is broad-ranging and erudite and promises to become a classic in the field. Part I. Background: 1. Introduction; 2. Before the Mongols; Part II. Political-Economic Relations: 3. Formation of the Il-qans, 1251–65; 4. Grand Qans and Il-qans, 1265–95; 5. Continuity and change under Ghazan, 1295–1304; 6. Sultans and Grand Qans, 1304–35; 7. Economic ties; 8. Overview of the relationship; Part III. Intermediaries: 9. Marco Polo and Po-lo; 10. Qubilai and Bolad Aqa; 11. Rashid al-Din and Pulad chinksank; Part IV. Cultural Exchange: 12. Historiography; 13. Geography and cartography; 14. Agriculture; 15. Cuisine; 16. Medicine; 17. Astronomy; 18. Printing; Part V. Analysis and Conclusions: 19. Models and methods; 20. Agency; 21. Filtering; 22. Summation.